SUBSCRIBE NOW!Don't miss anything we post. Join our email list TODAY! Make this dreamy crocheted newborn set for your little sweetie. It comes with a vintage-inspired blanket and a charming teeny hat. The set also makes for an exquisite gift to bring to a baby shower. In fact, this pattern is a great project for experienced beginner crocheters. Once finished, the baby blanket should measure approximately 45 inches wide. In metric measurements, the completed crocheted blanket should have a width of about 114 cm. The hat should fit most newborns. Directions on how to craft the pompom are also provided in the pattern. This lovely crochet baby set is another design by Lisa Auch. In fact, you can access the FREE pattern for the comfy crochet blanket and cute crochet hat from her website. 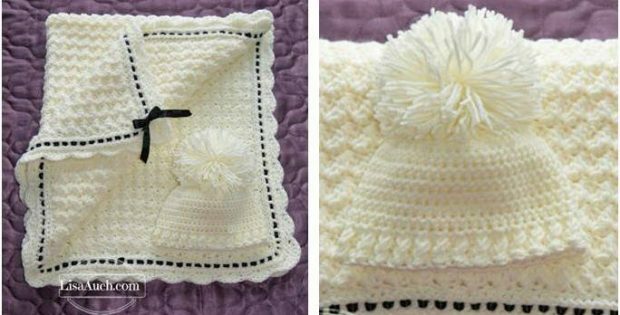 To access the FREE pattern for this crocheted newborn set, please click on this link: Crochet Baby Blanket & Hat Pattern. Featured image: Lisa Auch (Crochet Patterns Free) – thank you! This website contains affiliate links. When you make a purchase through these links, we receive a commission. This small contribution helps support The Crochet Space and allows us to continue to bring you more articles, etc. Crochet Squares, Mandalas, Flowers, etc. The Crochet Space Copyright © 2019.